Door glaze comes in several colors... Brown, black, white and gray are most common. The cabinet manufacture wipes on the glaze by hand, then using a clean cloth wipes off the excess. The left over glaze on the door and drawer changes the color of the cabinetry overall and enhances the decorative edges of the door style. Because glazing changes the color of the door, if you like glaze... You would definitely want to see a sample swatch of your chosen glaze with your chosen door color. Even better, see your chosen door style with glaze and color options. Sample doors can be ordered from the Kitchen Gallery for usually about $75. 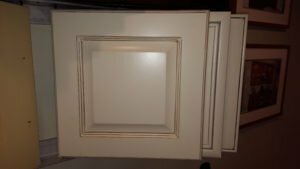 Below is a photo of a door that is painted in an antique white and a chocolate glaze.